In 776BC, the Olympics consisted of one day’s running and wrestling. A hundred years later, chariots and single horses arrived, thanks to the influence of Phaidon of Argos (a big shot in seventh-century Greece), and I dare say the civic pride which each participating Greek city-state brought to the Games was already running high. But I don’t suppose either Phaidon or Baron de Coubertin would have predicted the move which triggered this piece of litigation. 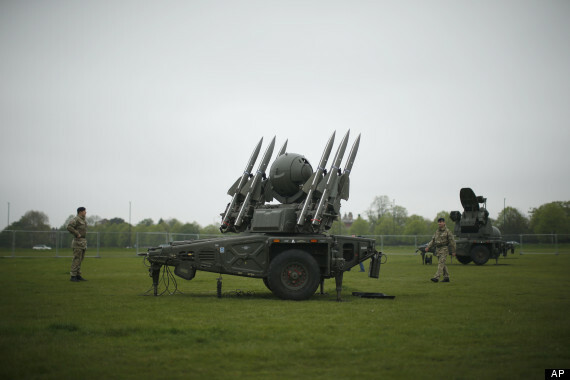 The MoD decided to site a missile launcher and military personnel on the roof of a Council tower block in Leytonstone during the Olympics. Like all military hardware, it has a nice acronym, GBAD, being a Ground Based Air Defence system. Anyway, a residents’ association formed by residents of Fred Wigg Tower, 15 storeys and containing 117 flats, decided to challenge the MoD. As their petition put it, “We, the undersigned residents of FWT, Montague Road, Leytonstone E11 3 EP, do not want explosive missile systems placed on the roof of our home”. Nor, I suppose, do any of us, but some of us may want someone else to have missile launchers on their roofs. The challenge started out on three grounds, a failure to carry out an adequate consultation process, a failure to comply with the public sector equality duty, and a breach of Article 8 and/or Article 1 of the First Protocol (A1P1) of the European Convention on Human Rights. It then transmuted into claims for an order that the Secretary of State should order the Royal Engineers immediately to build a stand-alone tower or gantry somewhere on Wanstead Flats where there was plenty of space, alternatively, that hotel accommodation should be made available to those residents who objected to living below the GBAD. (1) Given that the claim related to national security, operational deployment and the exercise of the Royal Prerogative to defend the State and its citizens and lawful visitors against threats, there was no duty on the Secretary of State to consult the residents or anyone else. (2) The Secretary of State did in fact carry out an Equality and Diversity Impact Assessment before coming to his decision. (3) Whilst Article 8 Rights were potentially engaged (and the matter was justiciable), there was no breach of Article 8 (or A1P1) because (a) interference with the residents’ enjoyment of their homes would be minimal, (b) it was ‘in accordance with law’, (c) it was manifestly proportionate in all the circumstances, in particular given the risks and the wide margin of appreciation accorded in this arena of security and the exercise of the Royal Prerogative, and (d) Article 8 rights were, in fact, taken into account during the decision making process, which was made at the very highest levels. (4) The construction of a stand-alone tower or a ‘gantry’ to house a GBAD had been dismissed at a high level as obviously impractical. (5) the claim for relocation to a hotel presupposed (a) there was a credible threat (which there was not), (b) there was more than negligible interference with Article 8 or A1P1 rights (which there was not) and (c) the only legitimate response of the State was relocation (which was not correct since the response of the State to the threat was proportionate). 24. I turn to consider the law. In matters of national security and deployment of the armed forces, it is well know that “the Courts will be very slow to review the exercise of prerogative powers…” and will avoid being drawn“into an area which, in the past, they have entered, if at all, with reluctance and the utmost circumspection” (per Lord Bingham in R v. Jones  UKHL 16 at ). The deployment of military personnel and equipment for national security and defence of the realm purposes “has always been regarded as a discretionary power of the Crown into the exercise of which the courts will not inquire” [per Lord Hoffmann in Jones at ]…..
25. There are three limited exceptions to this principle. First, where the act in question falls outside the ambit of the discretionary power (see Jones (supra) at ). Second, where the act is not done in good faith…… Third, where a statute requires a review of the act in question….. The proposed deployment is clearly within the ambit of the discretionary power and is made in good faith and, accordingly, the first two exceptions can be dismissed. The only relevant exception is the third, in view of the Claimant’s claim under the Human Rights Act 1998. Unsurprisingly, the response to the Article 8 point was that the Government had an Article 2 duty, to prevent or deter an attack on the Olympic Park which would lead to massive loss of life. The Article 2 consideration necessitated the deployment of the GBAD i.e. even if it was to have a substantial impact on the residents’ other rights. As it was, the judge found that there was no interference under Article 8 because the effect on the locals was negligible, and in any event the response was necessary and proportionate. The Plan is necessarily ‘multi-layered’ to ensure that the Olympic Park is protected by concentric lines of defence. This will include the following: (a) temporarily restricted airspace over London for the period of the Games to be in place for the opening of the Olympic Village (mid July); (b) Typhoon fighter jets operating from RAF Northolt; (c) Helicopters operating from HMS OCEAN moored on the Thames at Greenwich and elsewhere; (d) a network of air observers and radars; (e) four Rapiers sites (Blackheath, Oxleas Meadows, Barn Hill, William Girling Reservoir) providing the first part of the Ground Based Air Defence (“GBAD”) system in a ring within 7-14 km of the Park; and (f) two High Velocity Missile (“HVM”) sites overlooking the Park and covering the airspace above and around it forming the inner part of the GBAD system. The use of human shields is prohibited in both international and non-international armed conflicts by Customary International Humanitarian Law (http://www.icrc.org/eng/assets/files/other/customary-international-humanitarian-law-i-icrc-eng.pdf, Rule 97). Since the fight against terrosim cannot take place in a legal vacuum, we must take IHL provisions into consideration. I cannot help thinking that the location of missiles and military on top of residential buildings looks too much like the use of human shields. It probably would if the so-called “War on Terror” was actually a war and therefore IHL applied no matter what. Question: Would it be a war crime in case of civilian casualties? For those who feel tempted to answer that this has nothing to do with an armed conflict, why doesn´t the government use conventional police instead of the military? Is the Army supposed to apply principles like the proportionality in the use of force? Thanks for this post! The idea that there are three ‘limited’ exceptions seems both off and funny. It seems off because the gist of the judicial comments in this area appears to be that review will obtain in exceptional circumstances, but the judges have hesitated both to articulate a set of categories and to pronounce any such categories closed as this judgment suggests. But it is also funny because the ‘limited’ exceptions of ‘outside the ambit of discretion’ and ‘where a statute requires review’ basically mean that anything that fails on any public law grounds or potentially violates the Convention is open to review (the latter on grounds that the HRA 1998 requires review of such acts). Couldn’t some of these cuddly toys have been placed on top of one or two homes owned by multi-millionaires/billionaires? If the above had taken place (as described by me) and thus been the case, currently, would it have meant that the government would have been, potentially, exposed to far more pressure than a bunch of grocers and milkmen, postmen and town hall employees can offer, or could ”ever” offer in resistance? Seems the common folk (not in speech or worthiness but ordinary people) are again the done-with-us-as-they-pleased lot, much the same as in some year like 1302 or 1509, when people had no books, could not read or write anyhow, and land was given as presents from one powerful oppressor to the other, while by the turn of the 20th Century things had not been that much improved upon with the work houses being the social security of the day, and not much later during the last century even a one Mr Charlie Chaplin was forced to live in one as a child, therefore, here we have so-called modern Britain, that in the name of pomp and show (splendour? ), is willing, potentially, to blow up people much like Al Qieda, if as they say, need be, and what of the danger of someone now targeting these rocket sites themselves. Is not this the same as Palestine, where rockets are launched from civilian homes, does it not mean that the inhabitants of the homes are in danger of their buildings being attacked simply because they have rocket launchers stationed on top of them? I reckon it does mean they are in danger. Whereas perhaps nobody would have been out to blow up people during the Olympics, now with all of the publicity, many a lunatic may have been handed, in this way, ideas, by the government. The Olympics seem to represent no forward striving global policy adherent to inclusion, more like adherent to the age old bullying, however, they the games do seem to mesh in with policies of world dominance and oppression, where the games are being used to advertise the most CSR-unfriendly groups, institutes and large scale businesses. does this document, in fact, actually exist???? An Equality Impact Assessment (EIA) involves predicting and assessing how a policy, strategy or project will affect a wide range of people with different needs. It is a way to make sure that individuals and teams think carefully about the likely impact of their work on equality groups and take action to improve services, policies, strategies and projects.The characteristics which could mean that someone experiences policies differently include (but are not limited to); Age (old or young), Gender, Sexuality, Ethnic Origin, Disability, Religion, Low Income, Lack of Basic Skills. If that was my home, I wouldn’t consider such interference to be “minimal”. I would pack my bags and be out of there for the duration of the Olympics. The trouble is that (like myself) many of these residents probably don’t have enough money to spend on hotel bills. I wonder if Theresa May would consider such interference “minimal” if these missiles were on top of her home! I have absolutely no doubt that she object! You’re right, Busybeebuzz, I think most reasonable people would recognise that. I’m afraid that this could be another example of how the Tory mind works. For them – ‘an Englishman’s home is his castle,’ but for the ‘little people,’ it is permissible in Tory law to erect missile launchers at their homes. I’m a bit surprised that no mention was made at all of the protection from quartering of troops in ones home in the Petition of Right. I realise that the troops are not literally being housed in the residents own rooms, but there will be a round the clock military presence in the building where they live, so it does not seem very far removed from the original menace this was supposed to stop. Given that the only case law on this, the American case Engblom v Carey, interpretated it quite widely, it seems worthy of a mention at least. Might be amusing to see the ‘Equality and Diversity Impact Assessment’ that was carried out for this – do you have a link?